Casey, our beloved dachshund-cocker mix, was attitude with fur. We had raised her from a pup after adopting her from a local shelter. She was a fixture in our household (literally, since she shed her own body weight in fur each day). She was always there for us. So it was a pretty sad day when she passed away suddenly at the tender age of nine. I'm a dog person. I crave canine companionship. Being without a pooch around the house was unthinkable, so we immediately adopted a "rebound dog" named Murphy. Big mistake to rush into an adoption while grieving for a pet. Murphy turned out to be a biter. (My hand still bears the scars to remind me.) Murphy was later re-adopted to a person who was not as fond of all of his digits as I was. My wife made it very clear after that incident that she was in no big hurry for another dog. As summer drew to a close, my wife and daughters went to Indiana for a couple of weeks to visit the in-laws. 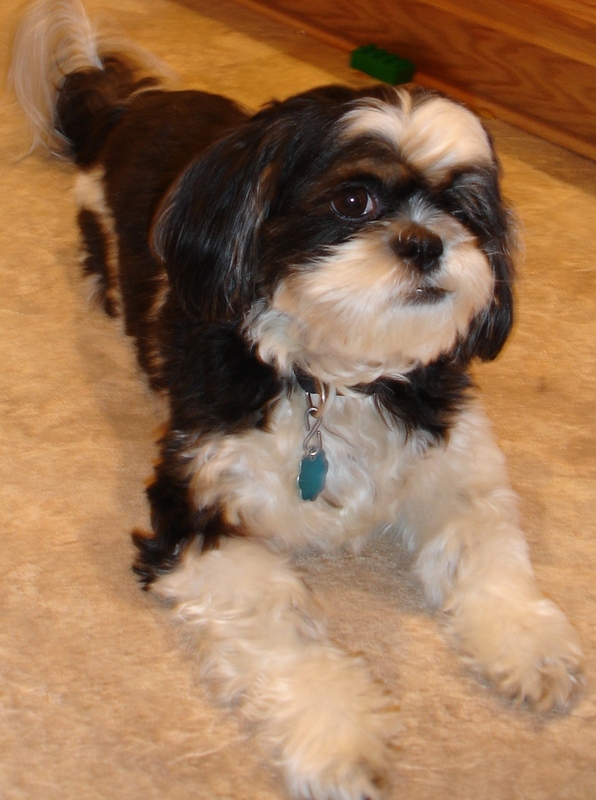 As fortune would have it, a couple at our church was trying to find a home for their Shih-Tzu named Zorro. He was very affectionate and his hobbies included napping, snoozing, sleeping, and dozing. While the family was away, I agreed to keep Zorro for a few days... you know, just to take him for a "test drive." We hit it off famously. Zorro became "my little man" around the house. Suffice it to say, my wife was not as amused by the new family addition. Casey had been her dog. This little furry intruder smelled funny. He could also be somewhat demanding and would bark at my wife when he wanted something, even when I was in the same room (oh great, a sexist dog... what do the HR manuals say about that?). Then he committed the ultimate sin, involving one of my wife's shoes and a somewhat private act that was made very public. But by then, Zorro and I had built a solid relationship. So now my wife tolerates Zorro. (We'll leave terms such as love, like, enjoy, amused, and "not repulsed by" alone for now.) He's the big elephant in the room that fits conveniently into the Shih-Tzu body packaging. I was reading David Maister's blog (thanks to Bob McIlree for recommending it to me). In his recent post, he talks about how, as a consultant, he's brought in to a client for occasionally ulterior motives. He also shares how his very presence as a new team member, while welcomed by some, threatens others. I can definitely relate to that. As the outsider, it's virtually impossible to avoid office politics. On a project a few months ago, it took me three weeks and considerable executive interjection just to publish a project organizational chart (usually a one-day no-brainer task in every other client). My point is that one cannot afford to be an "ostrich" when it comes to office politics. Avoidance strategies generally make things worse, whether you are a consultant, cubicle-dweller, or executive. The answer is intelligent engagement in office politics. David quoted Ben Franklin, saying, "you don't persuade by appealing to people's sense of reason, but to their interests." Sage advice. Everyone is motivated by something, and often it's a simple acknowledgment of another's point of view that can diffuse a difficult situation. There's a time and a place for avoidance, but those situations tend to be temporary. Now... I wonder if I should get Valentine's Day flowers for my wife in Zorro's name. "I wonder if I should get Valentine's Day flowers for my wife in Zorro's name." Tim, great post on little Zorro...thanks for directing me to it! These little shih tzus wind their way into our hearts, assertive and sweet critters that they are.